Box Hill, a residential suburb 14 km east of central Melbourne, is between Camberwell and Blackburn. 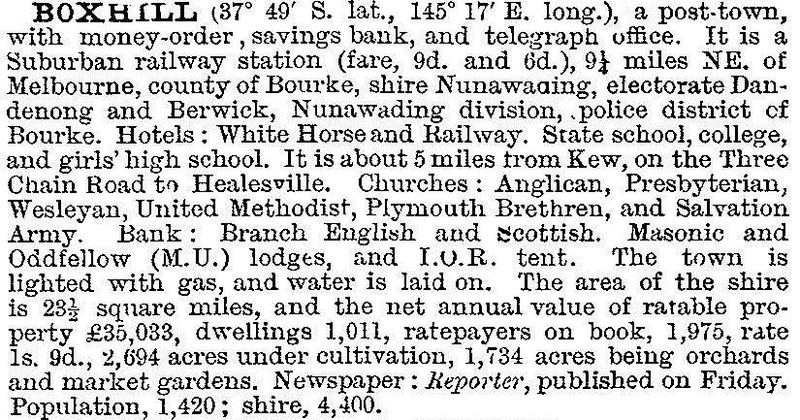 In 1875 it was part of the Nunawading Shire, which stretched from Camberwell to Ringwood. When the shire was divided on 26 May 1925, Box Hill was a compact municipality of 21.5 square km, bordered by Warrigal Road, Koonung Koonung Creek, Middleborough Road and Highbury Road. It contained Box Hill North, Box Hill South, parts of Burwood, Surrey Hills and Mont Albert, Bennettswood and Burwood's original village of Ballyshannassy, where the Burwood cemetery is situated. An early land purchase in Box Hill was Henry Elgar's special survey of eight square miles, acquired for one pound an acre. It ran from the Koonung Koonung Creek to Ballyshannassy Road (Burwood Highway) and extended west from Elgar Road to today's suburb of Canterbury. After 1850, settlers came to Box Hill as Crown lands were subdivided and sold. There was a three-chain wide road planned as the route to Gippsland from Melbourne. The road ultimately went as far as Healesville via Lilydale, but traffic along it encouraged the building of a hotel at Box Hill in 1853. Its owner named it the Whitehorse Hotel, and the name was bestowed on the three-chain road. The hotel was on the corner of Whitehorse and Elgar Roads, the latter running along the eastern side of Elgar's Special Survey. Ballyshannassy, 4 km south of Box Hill was the only official surveyed town in the area, but it was small. In 1861 a post office was opened at Box Hill, the first official use of the name. The postmaster proposed the name, derived from Box Hill in Surrey, England, near his birthplace. Agriculture around Box Hill was in an early stage of development as fire-wood cutting gave way to orchards, vineyards and mixed farming which gave meagre returns. In 1871 Box Hill township's population was 154. The extension of the railway from Camberwell to Lilydale in 1882 included a station at Box Hill but there were also stations at Canterbury and Surrey Hill, to the west. They attracted subdivisions and development ahead of Box Hill. Growth came, though, with a school opening in Box Hill in 1887 and the Nunawading Shire deciding to meet in the Box Hill court house. Less obviously, two years before, an artists' camp was formed about 2 km south of Box Hill near the beginning of Gardiners Creek. The untidy bush was painted outdoors and Roberts, Streeton, McCubbin and Abrahams went on to their 'Heidelberg school' of painting. Unlike suburbs closer to Melbourne, Box Hill lacked the web of tramlines which promoted residential development beyond reach of the railway line. In 1916-17 tramlines reached the western edge of what in a short time would be the Box Hill municipality at Burwood, Mont Albert, and Wattle Park. The years after World War I saw Box Hill's turn for residential growth. A girls' technical school was built in 1924 and a boys' high school in 1930. During World War II a boys' technical school was opened. In 1925 Box Hill borough was created by severance from Nunawading Shire and two years later it was declared a city. Its area was 21.5 square km. Post-war housing expansion included a Housing Commission estate in Box Hill South. A district hospital was opened in 1956. The shopping area enjoyed growth and prosperity which, ironically, by the end of the 1950s was putting strain on it: there was not enough space for parking. The development of Myer Eastland and Doncaster Shoppingtown in the late 1960s took trade away, and the shopping centre regained custom by undergrounding the railway line and station and building Box Hill Central on land which included the old market. Many shops in Carrington Road, Station Street etc sell Asian goods or are Asian restaurants. In 1954 the Melbourne and Metropolitan Board of Works designated Box Hill as one of five district centres for metropolitan Melbourne. Notwithstanding the private sector's predilection for going around plans in search of cheaper land for development, the plan has succeeded somewhat in Box Hill. In addition to the shopping centre (Box Hill Central and Whitehorse Plaza), the Box Hill TAFE and several office buildings have strengthened its centrality in the region. There is a large bus interchange next to the railway station. Apart from commercial functions there are large reserves with ovals in three directions about 1 km from Box Hill Central. The present Box Hill suburb extends west to east, from Elgar Road to Middleborough Road. Its northern boundary is Thames Street and its southern boundary is Canterbury Road. Its neighbours, Box Hill South and Box Hill North are described separately. Box Hill has several heritage sites. The largest is the Standard Brickworks (c1884), near Surrey Park. (The park contains the Surrey Dive, a former clay pit excavated by another brick maker.) Another imposing structure is St Andrews Uniting (formerly Presbyterian) church in Whitehorse Road. The bluestone building was rebuilt in 1935 after being dismantled at its original site at the corner of William and Lonsdale Streets, Melbourne, where it was constructed in 1867. On a smaller scale, the memorial for Sidney Myer (died 1935) is in the Box Hill cemetery. Box Hill city was amalgamated with Nunawading city on 15 December 1994, to form Whitehorse city, renewing the boundaries that began with the Nunawading parish and subsequent shire. In 1986 the median price of a house in Box Hill was 8.5% above the median for metropolitan Melbourne, and in 1996 it was 22% above the metropolitan median. During the 1990s there were two school closures – St Leo's Catholic school and Box Hill primary, along with four in neighbouring Burwood.